A solar wind stream flowing from the indicated coronal hole should reach Earth on Oct. 9th. Credit: SDO/AIA. DRACONID METEOR OUTBURST: On October 8th, Earth will pass through a network of dusty filaments shed by Comet 21P/Giacobini-Zinner. Forecasters expect the encounter to produce anywhere from a few dozen to a thousand meteors per hour visible mainly over Europe, northern Africa and the Middle East. 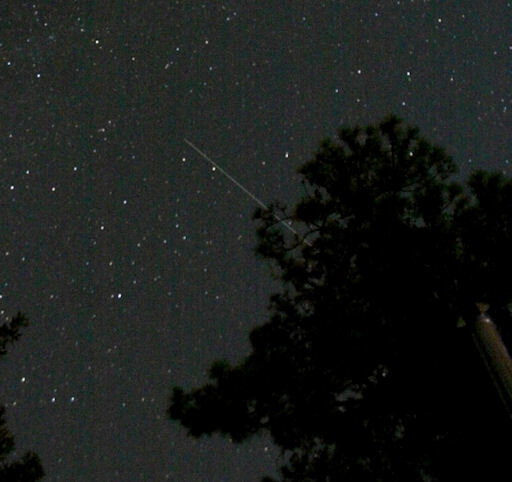 The meteors will stream from the northern constellation Draco--hence their name, the "Draconids." If the maximum around 1900 UT reaches 1000 meteors per hour, the 2011 Draconids will be classified as a full-fledged meteor storm. The question is, will anyone see it? Bright moonlight over Europe, Africa and the Middle East will reduce the number of visible meteors 2- to 10-fold. The situation is even worse in North America where the shower occurs in broad daylight. One way to enjoy the Draconids, no matter where you live, is to listen to them. The Air Force Space Surveillance Radar will be scanning the skies over the USA during the shower. When a Draconid passes through the radar beam--ping!--there will be an echo. Tune in to Space Weather Radio for live audio. In Europe, an international team of scientists plans to observe the shower from airplanes flying at ~30,000 feet where the thin air reduces the impact of lunar glare. In Bishop, California, a team of high school students will launch an experimental helium balloon to higher altitudes, 100,000 feet or more, where the sky is black even at noon. Cameras in the balloon's payload might catch some Draconid fireballs during the peak hours of the outburst. Stay tuned for updates as Earth approaches the debris zone. "The Tiangong 1 passed between Cygnus and Cassiopeia shortly after sunset," says Greiner. "It was surprisingly bright, easily seen with the unaided eye." Readers, check Spaceweather's Satellite Tracker for sighting opportunities in your hometown. You can also turn your smartphone into a Tiangong-1 tracker by downloading the Simple Flybys app. On October 7, 2011 there were 1250 potentially hazardous asteroids.